In October 2014, under the auspices of the United Nation’s Special Envoy for Youth, the First Global Forum on Youth Policies was hosted in Baku, Azerbaijan. The aim of the conference was to bring together young activists and experts, development professionals, and government representatives to gauge progress made on the World Programme of Action for Youth (WPAY), the state of global youth policies, and to set a new agenda for youth policies globally. At the same time, South Africa’s Deputy Minister in the Presidency – Hon. Buti Manamela – has been leading the process of drafting a new youth policy for the 2014-2019 period. Young South Africans, too, have been sharing their ideas through platforms such as the Future Now SA campaign, launched by the ACTIVATE! network. Twenty years into democracy – and since the WPAY was first adopted – the invitation to all South Africans to comment on the draft new National Youth Policy provides us with an opportunity to reflect on what the prospects for youth policy to influence the situation of young South Africans really might be. One of the tough realities facing young people around the world is that they are a tricky group to “place”. On the one hand, it would be easy to argue that there is no need to explicitly legislate for young people – their ‘issues’ (education, employment, safety, health etc) are everybody’s issues. Across the globe, we also see strong disagreement on what constitutes youth: the UN and World Bank define youth as being between 15 and 24, but most developing world countries extend the definition to the age of 35, and in some extreme cases even 40. The difficulty of an age-bound definition is that it is in many ways an arbitrary indicator: a 35 year old professional, a teen parent, and a 22 year old manual labourer are all living extremely different lives. And yet, aggregate indicators do paint a disturbing picture for young people more broadly. In South Africa, young people are more likely to be unemployed, to have HIV, to be victims of violence, amongst others. But, many would argue, the experience of being young is determined less by age alone than by the intersection of other identities. Young Activators (who are driving the Future Now SA campaign) for example, argue that “we each have different needs. We are not a homogenous group. Women experience unemployment, sexual violence, and health burdens disproportionately. LGBTIQA  youth often experience high-levels of discrimination, harassment, and violence. Rural youth are particularly disconnected from opportunity. Black and coloured youth face higher levels of unemployment, poor quality education and poor services”. It is, therefore, this diversity of identities that we need to be cognisant of when we consider a new agenda for youth policy globally. South Africa’s previous youth policy (2009-2014) has been globally hailed specifically because it names ‘target youth groups’ rather than just relying on the age definition as a catch-all. Our policy has specifically targetted young women, people with disabilities, unemployed youth, youth in rural areas and youth who are not in school, amongst others. In Baku, the naming of target groups was hailed as a critical piece of the youth policy puzzle. But, naming target groups is not the same as creating specific policy that caters for diversities created by identity-intersections. A truly effective youth policy would, therefore, need to see youth identities as intersectional, and be able to guide effective interventions that speak to those intersections. In effect, what this means is that youth policy must then be able to walk the fine line of advocating for measures that address the risks, vulnerabilities and strengths of specific young people, while at the same time setting a broad tone, expectation and set of interventions for the youth population as a whole. Who we are matters. Too often we overlook the importance of building a powerful identity, a sense of agency and ownership over our futures … the campaign calls for a reimagination of young South Africans – one that embraces our complexity, builds our power and supports our sense of belonging. We all contribute to a thriving society. We are all committed to transforming our own lives, our communities and our nation. We know transformation will stretch us out of our comfort zones. It will require courage and conviction. We are ready for the challenge – and we expect every part of society to join us. In truth, young people’s particular disadvantages often sits at the heart of the social dynamics of society: the terms of recognition between people, hierarchies of power, structures of exclusion, and the denigration of dignity. The opportunity for youth policy, then, is not simply to summarise education, employment or health and safety legislation through a youth lens, it is to transform how these services and interventions are delivered and experienced. One of the great risks of youth policy, because of its necessarily transversal and multifaceted nature, is that it often never gets implemented. For example, while the previous youth policy sought to establish ‘youth desks’ in every government department and municipality, very few have been instituted effectively, and those that have, often are not accessible to young people or influential enough to take action on young people’s behalf. 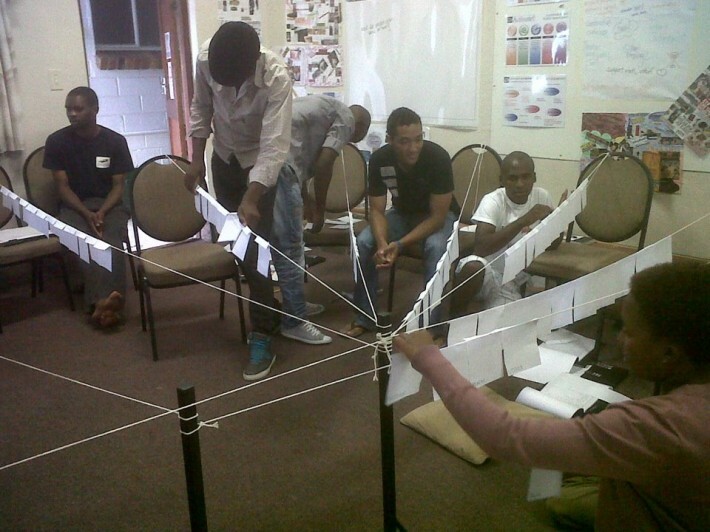 The National Youth Development Agency (NYDA) is also a potentially powerful agency for young people. However, it is often experienced as distant, ineffective, and at worst, corrupt. A critical aspect of youth policy must therefore be the consideration of how it is to be rolled out – relying, for example, on the internet to share oppportunities is ineffective in a social setting where only one-third of people have regular access to the internet and half of that access takes place through mobile phones and their accompanying high data charges. Youth policy must take to its heart questions of overcoming these high levels of disconnection, and the high transaction costs for young people, and build in solutions that improve young people’s access to information, the economy, and opportunity. In the Future Now SA campaign, Activators have, for example, called for specific measures to make public transport affordable and safe, and to ensure universal and affordable access to ICTs. South Africa’s constitution and government have put participation at the heart of legislative processes. However, often these participatory processes fall into the trap that Arnstein identifies. Young people in particular have struggled to find avenues for effective participation – the strength of political youth wings has meant that often the realm of participation extends primarily to those spaces, rather than in engagement with broader civil society and the youth public at large. It is not only a South African problem though – the Baku conference which brought together government ministers, policy experts and young activists was proclaimed by the organisers to be an example of strong youth participation. Yet, in reality the engagement between the ‘powerful’ government representatives and young people was almost non-existent despite participation being a core principle of the Baku Commitment.. Having young people in the room is not the same as young people participating actively in co-creating the policies that will affect them. Young people, too, must take responsibility to hold their representatives accountable, to participate where opportunities arise, and to set their own agendas for change. While it might have surprised some that South Africa’s 2009-2014 youth policy was upheld as a shining example at the Baku conference, the reality of young South Africans is far from the glowing plaudits our policies may receive. Over 50% of young people are unemployed, our education quality is low, young people experience high levels of violence, and HIV continues to take its toll on young people. The divide between policy on paper, and lived reality, is stark. If we are truly to have a youth policy that effects change for young people, we have to ensure that there are the capacity, resources, and support across the board for implementation. We should also seek more specificity on the particular effects that the youth policy is aiming for, and build the agencies and individuals’ capacities to drive that change across other government departments. Building opportunity for young people will also require all sectors of society to pull together – the quality of education relies on parents and communities working closely with their children’s schools; tackling youth unemployment requires business to think about ways of creating first-rung opportunities; building a dynamic and confident sense of self within young people relies on NGOs, youth groups, and communities to engage with and invest in young people. We must also demand high levels of accountability – including, as the Future Now SA campaign calls for, a Portfolio Committee on Youth to which various government departments and agencies could be called to report on their efforts to transform the situation of young people. The situation of young South Africans today is worrying; however, within this generation lies the sparks of real possibility for transformation of South Africa. As we embark on a new period of youth policy in South Africa, we need to work alongside young change agents and build their capacities; support multiple diverse and innovative interventions, bridging the gaps between government, civil society and business; and ensure deep accountability. Youth-led and youth-orientated civil society also needs to build its voice to be able to influence and effect the roll-out of policy for young people. Securing possibility, opportunity, and capacity for all young South Africans is a critical task for the next 5 years, and will certainly define the broader situation of the country as a whole. The irony of the event being hosted in a country that had recently imprisoned young democracy activists was not lost on some of the attendees. The tragedy that not a single mention was made by the diplomatic and senior bureaucratic elite of global agencies, was noticeable. In November 2014 Minister in the Presidency, Jeff Radebe, announced that a draft of the new National Youth Policy was ready for release. This document is now available to the public comment. Arnstein, S. (1969), ‘A Ladder of Participation,’ Journal of American Planning Association, 35(4): 216. Janet Jobson leads DGMT’s work on social dynamics (see the tabs under “Our Portfolios”). She attended the Baku Forum in October 2014.